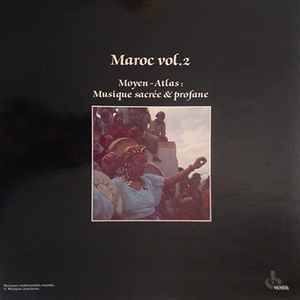 Morocco - Medium Atlas Range: sacred and profane music for festivities and ceremonies of the Aït Saïd, played on the qasba flute, the guembri lute and the bendir tambourine. These recordings were made in Morocco in May 1981 by an expedition organized in collaboration by Radio-France, the BRT (Brussels) and the WRD (Cologne). Reissue of January 1985, Paris.